Jesse Cohn is extremely widely read. 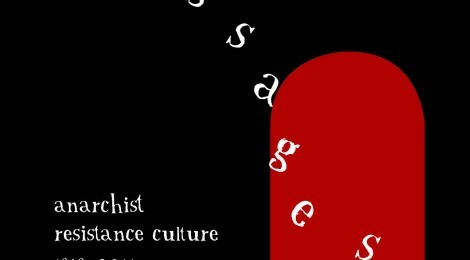 An academic and author of Anarchism and the Crisis of Representation: Hermeneutics, Aesthetics, Politics he now in this book tackles anarchist influences on and in art, whether it be fiction, poetry, songs, plays, illustrations,painting and cinema. He has read everything from Vallès to Ursula Le Guin, Stéphane Mallarmé to Kenneth Rexroth, listened to everything from John Cage to punk music. This present work is staggeringly encyclopaedic and comprehensive. Not only does he range across the vast territory of culture in most of its forms but he breaks out of Eurocentric preoccupations and includes China, Japan, Argentina, Brazil and Cuba. Cohn certainly succeeds in producing the most complete study of anarchist culture so far with sections of the book dealing with different aspects of culture with poetry, songs and music, fiction, drama, art and illustration and cinema dealt with in order. Now, art and politics have often been uneasy bedfellows as the individual artist wrestles with the need for artistic expression versus what can be a straitjacket of adhering to the right political line. The avant garde by its nature was not something that could be readily adapted to political and social movements. Cohn accepts that and draws attention to the “deliberately obscure” poetry of Mallarmé and the “entirely undecipherable” sound poetry of Hugo Ball (both identified as having anarchist influences and sympathies). As Cohn notes:”…the anarchist movement, which refused to nullify social commitments in the name of the autonomous individual, was not, on the whole, welcoming towards these experimenters, whose work, they often saw as wilfully obscure at best, more suited to the narcissistic enjoyment of a self-appointed elite than to the needs of working-class people in struggle”. He states that there is little trace of the avant gardes- be they Dada, Imagism, Futurism, Surrealism- in anarchist literature at the time of the flourishing of these movements and that anarchists developed their own art forms in their journals, with widespread use of poetry, but admits that the poetic forms were very often traditional. For example the anarchist Voltarine de Cleyre was producing political poetry in a “genteel” Victorian form at a time when modernist movements were in revolt against such gentility. Cohn does acknowledge the contribution of the French Surrealists to the anarchist weekly Le Libertaire, though he notes that some militants were concerned about the “hermeticism” (read closed-off world) and “originality for originality’s sake” that they thought was intrinsic in modern art. He signally fails to mention the German example of Franz Pfemfert and his political-artistic journal Die Aktion which had close links with Expressionist artists whilst pushing revolutionary anarchist and left socialist views, and ignores Expressionism and anarchist influences on it completely. He also ignores the quite close relation between the bohemians of Greenwich Village and leading members of the Industrial Workers of the World and the resulting artistic contribution to such struggles as the Paterson strike (see American Moderns: Bohemian New York and the Creation of a New Century by Christine Stansell). This problem of avant garde versus accessibility is tackled full on in Cohn’s concluding chapter. He addresses the period of 1945-1973 when the working classes of the wealthier nations were effectively co-opted into the apparent economic success and consumerism of that period. In response “anarchist resistance culture increasingly began to borrow from the styles that had developed in the bohemian counter-cultures of the late-nineteenth century and early-twentieth centuries, which had themselves grown up in the shadow of the anarchist movements”. He rather harshly describes the main tenets of the merging of modernist movements and anarchism as Noncommunication, Nonsense, Nonutility, Noncollectivity and Nonpopularity where there is a deliberate turning away from accessibility and the popular to the dramatic gesture, absurdity, abstraction, and aesthetic individualism. He seems to associate the period of what he incorrectly identifies with that of “propaganda by the deed”, that is the period when some anarchists used assassinations against members of the ruling class, as one when the connection between “aesthetes” and anarchists was strongest and that this waned once mass anarchist movements emerged. As a look at the lives of many anarchist artists shows, this was not strictly true as they maintained their allegiance through the rise of syndicalism and beyond. Similarly, just to take poetry as an aspect of culture. Some Poets in the period of 1945-1973 (which he describes as “valley times” as opposed to the periods of mass anarchist organisation before and the period of a turn towards huge attacks on the working class) like Kenneth Rexroth and Phillip Levine DID produce accessible poetry, alongside perhaps less accessible work. However he comes to no fully worked out conclusion as to break out of the subcultural ghettoes that he feels are self-imposed, other than posing “mutual aid, direct action , participatory democracy, cooperation etc” to a movement that he feels appears to be “ridiculous, inconceivable, unintelligible, nonsensical”. All he can fall back on as an alternative is citing groups like the British Reclaim the Streets of the 1990s where collective action is coupled with individual enjoyment and to the hackneyed concept of the Temporary Autonomous Zone, designed to avoid confrontation with the State “And to remain only as a shared memory.” Now as we know, RTS actions DID come into confrontation with the State. Other examples he points to are long established infoshops, bookshops, social centres, though he acknowledges that these too do not always successfully open to a wider and more varied public. Unfortunately at times Cohn lapses in academic and “hermetic” ways of expressing himself which he criticises some of the avant garde movements for. But all in all, the book is a massive compendium of an enormous number of contributors to anarchist culture in all its forms and has certainly inspired this reviewer to look at some artists and writers I had not heard of before and certainly asks the right questions about breaking out of the anarchist ghetto.